About the Cross Arm Breaker Match Guide: The ultimate goal of the Match Guide is to provide prospective and analysis from the wide ranging spectrum of matches that are occurring all over the world in 2015. From a small independent promotion such as Cara Lucha in Mexico to the Japanese leader New Japan Pro Wrestling to WXW in Germany, you will find original, analytic content about the best, worst, and everything the in between. We hope that these monthly, longer form pieces will spark debate and discussion and add to the current conversation that is so readily accessible via blogging and social media. And much more including Tomoaki Honma’s balancing act, Yuji Nagata’s (worked) injury) Shinsuke Nakamura’s (real) injury, and the ineptitude of Togi Makabe. 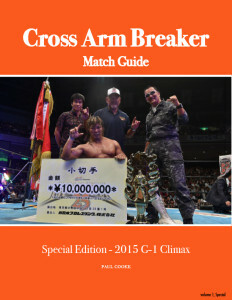 All previous seven editions of the 2015 Cross Arm Breaker Match Guides can be downloaded here.